The academic and research activities of Division of Plant Pathology for both Bachelor and Master program involve etiology of plant diseases; morphology, physiology and control measure of plant pathogens. Plant biotechnology is very well developed for classification of casual organisms, and for production of disease free seedlings. 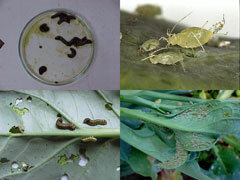 Plant diseases caused by virus, viroid and mycoplasma. Plant diseases caused by nematode. Postharvest diseases and seed borne diseases.